Aqua Mira is in growing use with backpackers and hikers..
"Aqua Mira to prevent the infamous beaver fever..."
Aqua Mira is the latest thing to ward off aquatic micro-organisms looking to invade your gut. Aqua Mira is used to treat all types of water. International trekkers and backpackers use Aqua Mira, of course. But one must also be aware that even the most pristine looking waters in North America can harbor giardia. 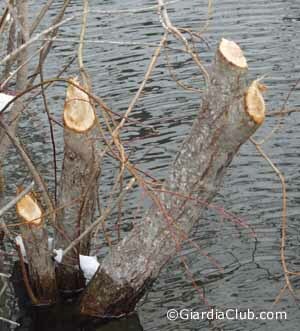 The photo, above, shows typical beaver sign where these excellent animals have cut a willow tree to store near their lodge for winter feeding. Beavers swim up and down this Rocky Mountain stream, and of course they don't run up to the nearest toilet when nature calls. Their feces is either in the water, or close enough to wash in during a rain squall. Beavers are one of the most notorious carriers of giardia. Hence the nickname for the sickness - "beaver feaver," as it was known amongst the mountain men. Water like this should be treated with Aqua Mira or some other water treatment method. In visiting with the manufacturers of Aqua Mira, we found out that it has gone through extensive testing required by the U.S. Environmental Protection Agency. Apparently this and many other treatment methods will kill the vast majority of organisms quite easily. The really difficult rascal is giardia. Even Aqua Mira takes some time to kill it - sometimes up to 30 minutes. The outer casing of the giardia cyst is hard. Most water treatment has a difficult time killing it. But in the labs and in our field testing,, Aqua Mira has proven quite effective. AquaMira - it's the taste.